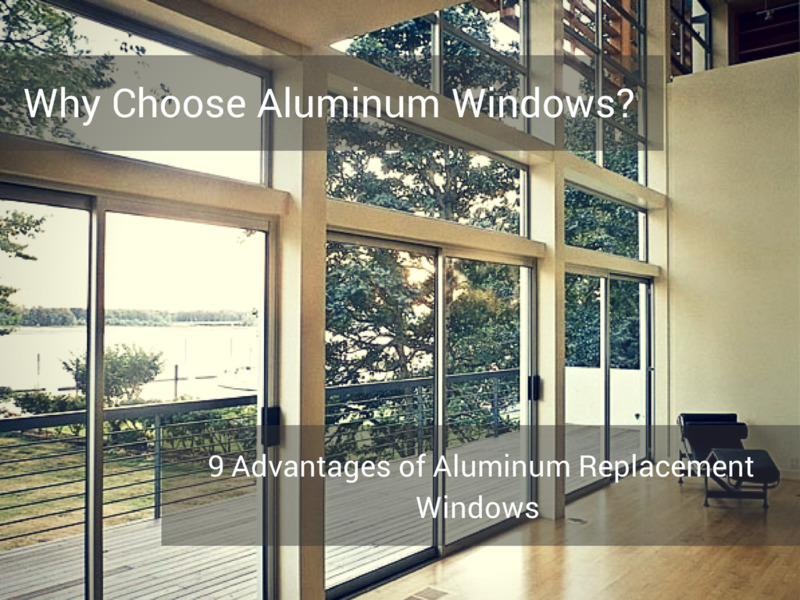 If you’re shopping for replacement windows, aluminum frames can be a great option to consider. Aluminum windows are popular because of their strength, low maintenance and noncorrosive properties. Today’s aluminum windows are equipped with thermal breaks to improve energy efficiency and many aluminum frames allow for flexible window configurations, making it a good choice for modern architecture. Review the 9 benefits listed below to understand why aluminum has been, and continues to be, the leading choice of architects and builders. The durability of aluminum windows is one of the most valued benefits of this type of replacement window. Aluminum provides not only greater strength, but is also more resistant to the elements and thus is less likely to warp or rot. Aluminum also has a high strength-to-weight ratio that makes it very lightweight and easy to form into many shapes and configurations. Aluminum windows require very little maintenance to preserve peak performance. With just water and a sponge, aluminum can be wiped clean in an instant. Additionally, since aluminum is pre-manufactured in color options, you won’t need to re-paint or touch up their finishes. High performance aluminum windows are able to meet or exceed energy efficiency standards. Aluminum windows can easily prevent heat gain and heat loss through windows by 60% rivaling more expensive options like fiberglass and vinyl. Aluminum windows outperform both wood and vinyl windows at controlling noise. Furthermore, aluminum is about three times heavier than vinyl and many times stronger than vinyl. Since aluminum has more mass, it delivers high acoustic performance and does an excellent job at stopping noise from entering or leaving your home. Aluminum windows can come in any color and are customized to match any color scheme or the design of your home. Thus, aluminum windows have been known to enhance your homes’ overall curb appeal. Aluminum gives you the option to have an elaborate window design at an affordable price. In addition to improving the appearance of your home, aluminum windows will also increase the market value of your home. Since most homeowners consider aluminum windows to be an asset, they’ll also be a top selling point for your home, especially if they are premium quality aluminum window installations. Aluminum windows are significantly less expensive than other energy-efficient framing options, providing a strong yet economical window solution, while also achieving excellent energy outcomes. They are economical, not only in the initial acquisition costs but also the maintenance costs in the future. Aluminum offers a vast range of possibilities for design schemes, finishes and glass options. Aluminum finishes are offered in a vibrant array of colors running the entire spectrum from traditional to contemporary allowing you to create any look, any feel, anywhere. Additionally, many modern aluminum window designs are unobtrusive of views of the outside. With a sleek and minimalist style, the incredibly thin frames allow for more glass and a wider view of the landscape beyond. Not to mention, they’re a fabulous source of natural light. The design possibilities make this feature more attractive in new construction where you can influence the design without elaborate renovation costs. Aluminum has one of the highest recycling rates of any metal and is an environmentally sustainable material. In addition, recycling aluminum requires only 5% of the initial energy consumed to create it. This natural characteristic found in aluminum differentiates it from other framing materials and reinforces its sustainable credentials. Next time you need a window replacement, turn to Frontline Windows & More, Inc. We’ve serviced homeowners across California since 2005 and are a family-owned and operated business. Contact us today to schedule a FREE In-Home Estimate and let us work with you on your next project!